Throughout our visit to Costa Rica, the team progressively learned innovative sustainable practices and about the importance and innocence of wildlife. Without the insight of each of our tour guides – Marcos, Ryan, Carlos, Rigo, Mila, and Javier, I do not believe we would have learned as much as we truly did. Each time we were introduced to a new tour guide, I assumed this was just another tour for them. But during each tour, the guides always managed to introduce a deeper, more sentimental and passionate story along with their wilderness talks, allowing me to see that their jobs truly make a difference. One example was when Amy asked Mila what she thought was a good way for students to get involved in helping out sustainability. Mila instantly began to tell us a story about a troop of monkeys having difficulty when trying to explore beyond their small living parameter because of the newly built street. She described how a ten-year-old girl brightly suggested tying a rope from one tree to another above the street as a mini freeway for monkeys to climb across. Mila continued to describe how the easiest and most important way for us to help is by simply speaking up about our innovative and new ideas. During our bird watching tour, zip lining and the night at the jungle experience at Hacienda Baru, Carlos, Rigo, Ryan and Marcos never failed to identify a bird, insect or even a tree. 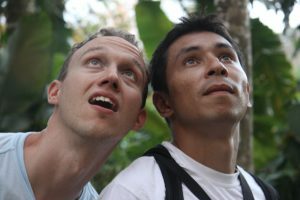 As we all played a small game of follow the leader while hiking in the jungle, Rigo would go ahead of the group and find a new animal for us to view through his telescope. The guides would then bury themselves into their wildlife books so that they can further explain about the specific animal. I came to realize that they try their hardest to give us the best possible experience with hundreds of facts about Costa Rica’s biodiversity. Each guide was unique in their way of teaching but when you think of them together, they all contributed to making our trip special. Carlos with his funny stories about baby sloths, Rigo with his eye for finding wild animals, Ryan with his genius insight into each animals background and Marcos personal tours through the jungle. I don’t know if the people I mentioned on here will read this. Either way I would like to thank you all. Thank you for welcoming us, for accepting our Spanish skills, for showing us your passions and for introducing your beautiful Costa Rica in the way that you all did! Plus everyone’s sense of humor only adds on to the many reasons why I cannot get over the experiences I had in Costa Rica. Encounter with a baby sloth! Our first encounter with a sloth was when we went bird watching early in the morning. 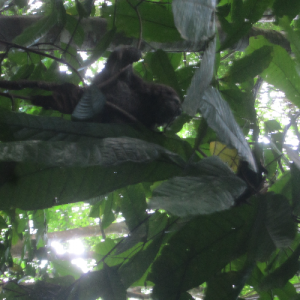 Within no more than 20 minutes, we found a sloth hanging in the trees. It was way high up in the branches but thanks to the telescope, I was able to see it SLOWLY moving. I was also able to see its face and I will never forget that adorable face. As we moved on, I found myself constantly searching for them high in the trees. My understanding and feeling towards sloths have changed completely since this moment. Before, the only thing I could think about when it came to sloths was that they are “lazy” as the name explains. They spend most of their life hanging from tree branches and sleeping. But the one we saw had such a soft smile and was trying to reach its hand out to grab leaves to eat. The tour guide told me that sloths only climb down from trees and go to the bathroom on the ground about once a week. I found that fact particularly interesting. The next morning, we were fortunate enough to see a baby sloth. Soon after we left the lodge we stayed at for a night in the jungle, we heard screeches from the trees right next to the path we were walking. When we looked up, we found out that it was baby sloth crying. 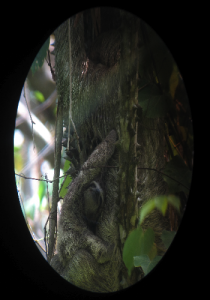 This time the baby sloth was not high up in a tree, instead it was hanging onto a thin low tree. The baby sloth was screeching to find its mother and trying to move to the tree next to it. The tour guide explained to us that the mother sloth spends 6 months with the baby sloth, then lets it grow independently. I felt happy to see a baby sloth from such a close distance, but when the tour guide told us that sloths could die by falling off from trees, I began to worry that the baby sloth would fall. It successfully moved to the next tree and a relieved cheer aroused from our members. I also really enjoyed the moment whenever we found an animal because everybody in our group would help each other try to spot the wildlife with our bare eyes. We shared the excitement by finding them together. I had my first exposure to mangroves in high school when I took an AP Environmental Science class, but it was amazing to finally see how big they were in real life. 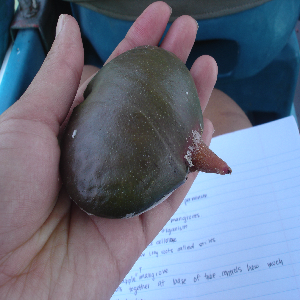 It was such an interesting experience because we got to see the different types of seeds of each species of mangroves. Mila informed us that mangrove seeds can float in water for a long time before actually taking root and growing. 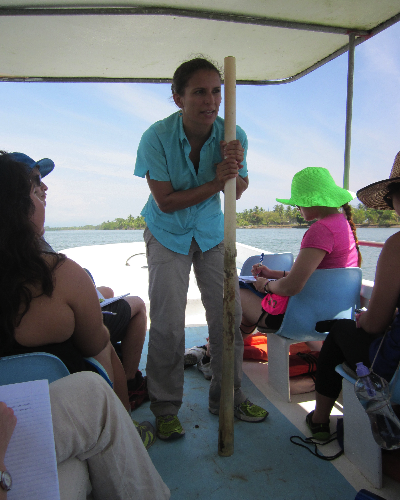 We also learned about the difference between red and black mangroves. 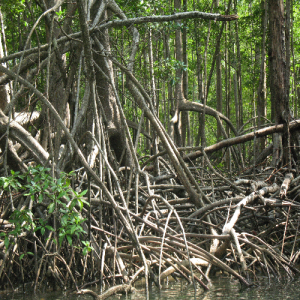 The red mangrove grows more closely to the muddy soil and uses the nutrients from the soil to grow. 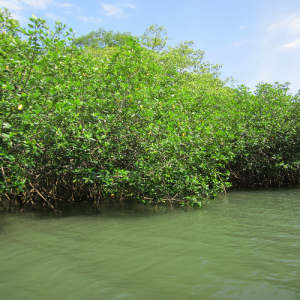 The black mangrove grows on land and serves similar purposes to the white mangrove. What’s the white mangrove? 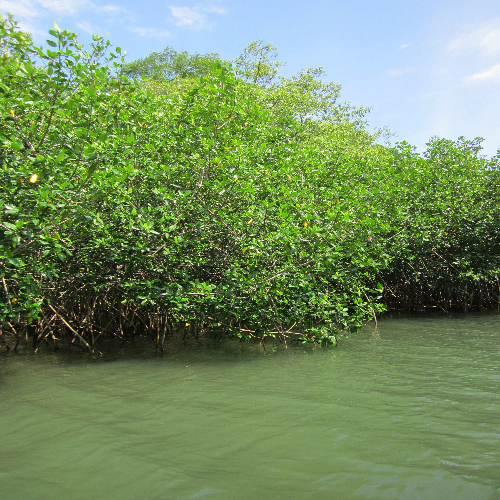 White mangroves help decrease soil erosion and keep small islands from crumbling and falling into the ocean or river. Mila explained there used to be an island on the site that we were visiting, however, due to erosion it was slowly sinking into the water. The locals and tour guides started planting mangrove saplings by slicing a PVC tube in half and placing the small mangrove sapling into the tube to help it grow tall and strong. Once the mangrove has grown big enough to support itself without being uplifted by the weather or water, the locals go back and remove the PVC tube. Through this technique, they have been able to plant more mangroves around the shore of the island and keep the island from sinking. 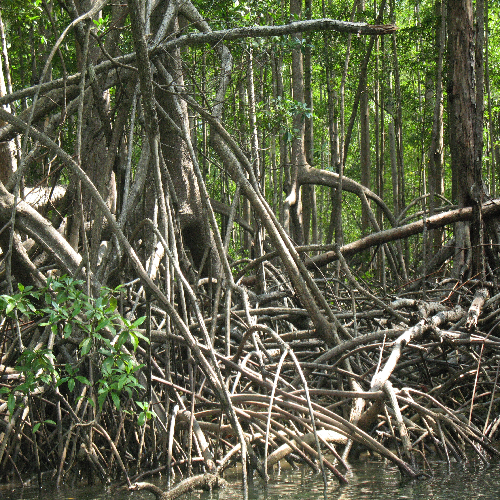 These mangroves have big, long, roots that extend into the water and provide areas for small water creatures to live. These small water creatures, such as the tiny blue crab, are important for the ecosystem because bigger fish prey on them and those fish are then preyed upon by the birds that inhabit the environment. I believe the best part of the tour was when our guide spotted a silky anteater on one of the mangroves. As a student of UCI, spotting a real life anteater is a big deal and probably one of the highlights of our trip! 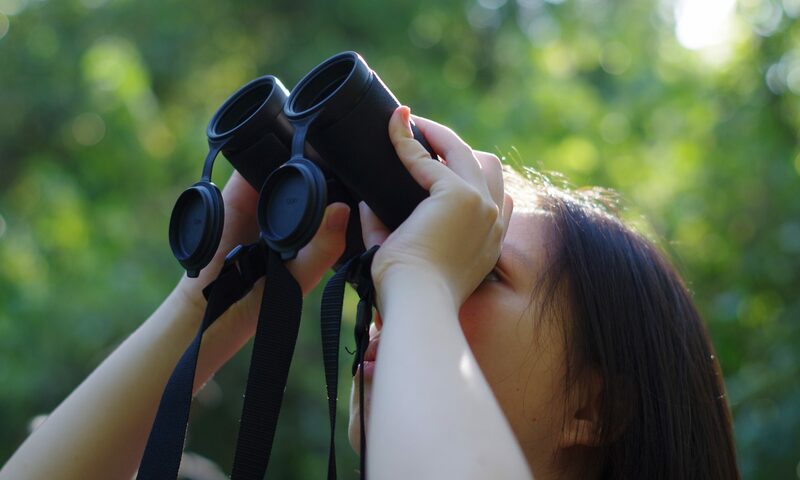 Witnessing the different forms of wildlife that resided in the mangroves and seeing the size of the mangroves as well as learning about the multi functions they served was an unforgettable experience. A couple of weeks ago, if you asked me what my absolute least favorite bug was, I would have rushed to say “ANTS! ANTS! MOBS OF ANTS!” before you finished asking your question. I used to think of ants (especially in groups of 4 or more) as annoying little pests whose sole purpose was to attack any and every crumb I might have in my kitchen, or worse, my dorm room. Our first hike in Costa Rica changed all of that. On our second day in Costa Rica, we decided to explore a little hiking trail next to our lodge through the Teak Tree forest in Hacienda Baru. As we were walking, Ryan (one of our tour guides) came to a sudden halt and directed our attention to the ground. We looked down and saw a trail of tiny bits of dancing green leaves cutting across the trail only to realize that there were little ants beneath the leaves carrying them to their nearby underground colony. As Ryan explained to us more about these small critters, the more I became absolutely fascinated by these creatures that I normally would have wanted nothing to do with. society. As each caste does its individual job, the ultimate goal is to feed the growing colony by harvesting fresh leaves that are used as compost for fungus food to grow on. Besides the queen ant, whose responsibility is being the sole reproducer for the colony, there are three different castes—the workers, the soldiers, and the minima. The workers, also known as mediae, travel long distances in the jungle to find the perfect leaves for their farm. It seems peculiar and even dangerous to travel such a long way but they do so because they are smart enough to know that they need the foliage around their colony to protect it from the rain. Once the medias find suitable leaves, they leave a chemical scent trail for other workers to follow. 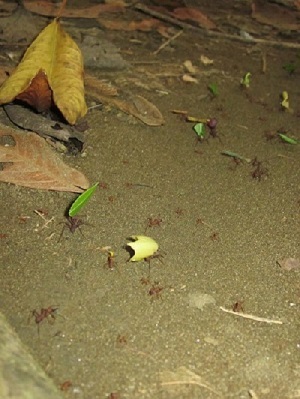 As they cut and carry the leaves back to their colony, other smaller ants, the minimas, ride on top and clean the leaves before they are allowed underground for the farm. These minimas also do a majority of their work underground, tending to the growing fungus inside of the colony. The soldiers are the largest subcaste and weigh about 7 times more than medias and 30 times more than minimas. Their primary responsibility is to protect the colony from intruders and do so by using their massive jaws and stings. They also clear the trail by moving things the medias and minimas cannot carry. When all three castes work together, they can maintain a colony the size of a small car inhabited by about 5 million ants. 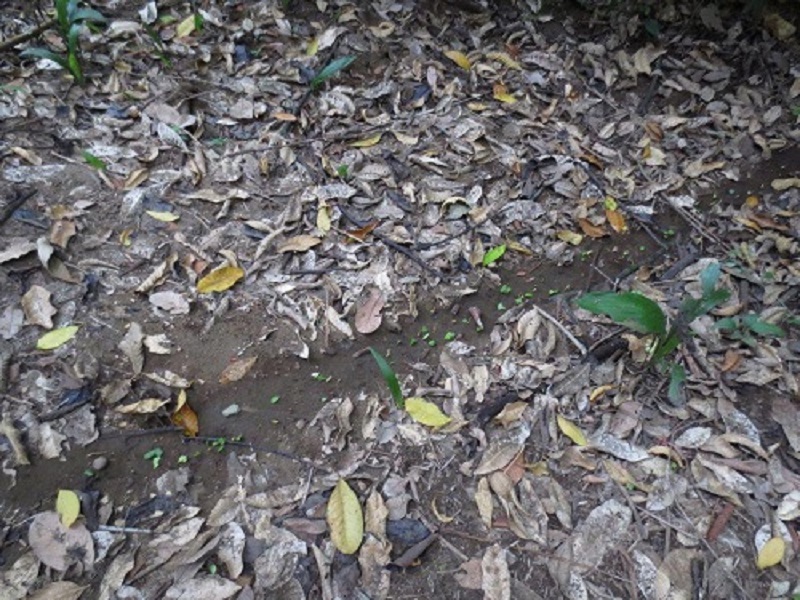 The level of organization and sheer size of these leafcutter ant colonies is truly fascinating. 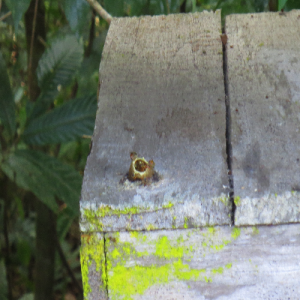 While we were in Costa Rica, we also ran into another kind of ant species—army ants. While we were working on the greenhouse behind the elementary school in Mastatal, we heard a sudden flock of birds flying out of the trees and a rush of bugs zooming past us, as if they were running for their lives. 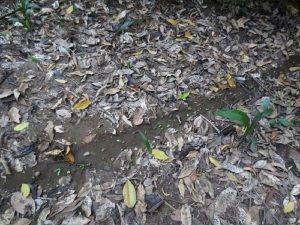 Within a couple of seconds, we saw a sea wave of ants storming up over a small hill out of the jungle. They swarmed on such a massive scale, it was as if the ground was painted black. It was clear that this colony of army ants was on the hunt. Although they are incredibly smaller than other bugs, they worked as a team to trap and kill bugs as big as cockroaches and spiders. After doing more research, I found out that they kill about 100,000 animals a day—mostly insects but they are also capable of killing lizards, snakes, chickens, and other small mammals. One of the most fascinating things about these critters is that the majority of them (all besides the queen and males) are blind and rely solely on chemical trails to find their way around and execute massive raids. As a nomadic species, these ants are almost always on the move except for when they create nests out of their own bodies to shelter growing larvae. Army ants, although seen as extreme pests, actually serve as natural pesticides as they clear out any unwanted bugs in farms and even human homes. Getting the chance to watch an army ant raid in person was an incredible as well as humbling experience. While back in the States we are used to forcing nature to work around us, this time we were the ones being forced to stop our own work in order for nature to proceed in its intended course. Knowing what I know now about leafcutter ants and army ants, it’s hard to believe that I once loathed such mesmerizing creatures. The short walk down the dirt road, passing a small purple house and cows lounging on a hillside, our noses were greeted by the poignant, rich smell of pure chocolate that led us to a chocolate farm. This chocolate farm, La Iguana Chocolate, is maintained by Juan Luis and his family. His family began the production of chocolate with pure cacao seeds and unrefined pure cane sugar in 2005, after studying eco-tourism. The land holds approximately 3,000 cacao trees about 2 meters in height with branches extending out that produce cacao pods growing from the trunk of the tree. 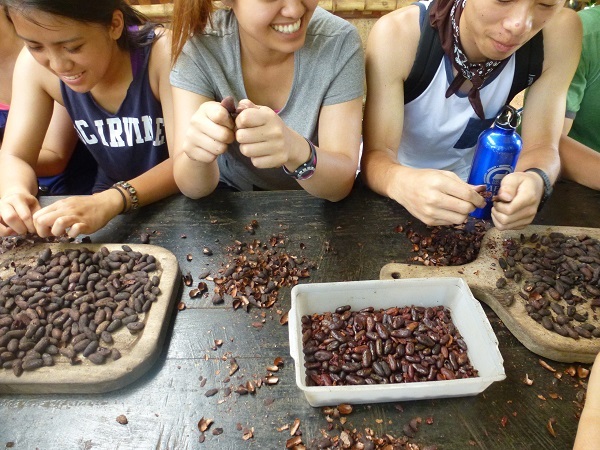 The trees produce the cacao fruit year round with peaks from September to November and throughout May and June. Each tree usually produced 30 pods of the fruit in one year. The trunk is lined with flowers but only 2% are fertilized and produce fruit. This small percentage is due to the only pollinating insect, the Loca fly. Once the pods turn yellow, they are cut off using a machete. The pods are opened and the seeds are extracted from the central area. The seeds are placed in a fermenting bath. Fun fact: the fermenting bath is as old as the farm! 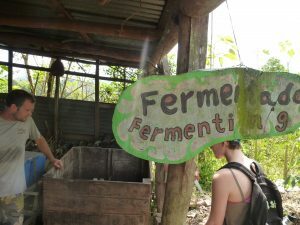 The seeds are enclosed in a soft texture of white goo, so in order to extract the seeds they are placed in a fermenter so the goo can be dried and seeds collected. The seeds are then placed on a screen to be dried out for 3-4 days, then 1 day in direct sunlight. The farm used to use a tarp but the seeds were not drying enough so they switched to a screen method. Also, if the seeds are stored properly in plastic bags they can be kept for up to 2 years! Next the seeds are roasted for about 20 minutes and are let stand to cool. The seeds are then shelled. (Our group was put to work at this step.) At this stage, you can really taste the chocolate, but without any sweetener they are very bitter! Hardly anyone liked the taste. The seeds were then placed in a homemade electric grinder. This grinder was created by an engineer from Ireland that was working the farm as a volunteer. The grinding resulted in a paste like substance. The paste could then be pressed to extract coco butter. The coco butter is used in several other products they make, like soap, chapstick, or placed back in the chocolate to add richness. The pressed powder/paste is then mixed with tapa dulce, also known as sugar cane. The tapa dulce is preferred because it local, healthier and stronger in flavor. The mixture is then placed into a spinner, which creates a finer mix, allowing the flavor to be blended in evenly. 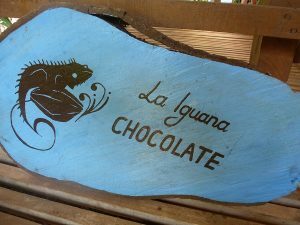 The La Iguana Chocolate final step is to weigh out 11g of the blend which is placed into plastic molds the size of three stacked quarters to then be sold…or eaten! Juan Luis and his staff gave us unforgettable behind the scenes look into seeing the purity of creating their delicious chocolate. And although it didn’t quite look like Willy Wonka’s chocolate factory, it tasted just as yummy! On one of our afternoons in Costa Rica, we came across stingless bees at a farm called Villas Mastatal. I had never heard of bees that did not sting people and were still able to produce honey. I learned these abejas (bees in Spanish) are known to locals as “markitas”. Not only do they not sting, they also practice selective pollination instead of pollinating all plants they encounter. These bees produce less honey, but their honey is much stronger, sweeter, potent and used for medicinal reasons. Our guide Javier told us a drop of honey is placed in a human’s eye if there is an infection. In addition, the bees seal up the chimney hole of their home at night with wax to prevent ants and other insects from crawling in. I thought the relationship between bees and a person in Costa Rica versus the United States is symbolic of how Americans view their wildlife. I know that where I am from, California, people always run away from bees and avoid them at all costs. We fear bees and underestimate their role in the ecosystem. They are critical to pollinating plants and making sure our plants and flowers are thriving. 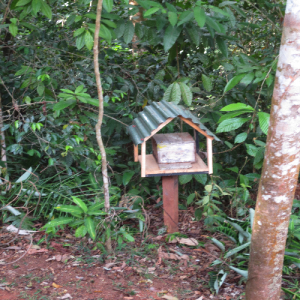 In Costa Rica, the bee homes are strategically placed close to the edge of the forest so they will be close to plants but the bees are free to roam as they please. Javier also told us that bees in America are typically Africanized bees and pollinate everything, not differentiating between crops. He also said it is bad for bees to pollinate only one type of crop and farmers often have to transport the bees from farm to farm to ensure they can pollinate efficiently. Even the bees in America are being put to work for the sole benefit of producing larger and more plentiful crops. In addition, although the bees from Costa Rica produce less honey, the quality is much higher and the people only take what they need. The United States takes a much more business-like approach to farming and reaping their crops. In Costa Rica, we visited four different farms and I noticed that fruits and vegetables were being grown in smaller quantities, but they were also using much more natural and eco-friendly methods of growing them. This shows Costa Ricans take what they need from the earth’s resources and do not try to produce unrealistic amounts by polluting their plants with pesticides and unnatural substances. I have a larger appreciation for people who locally grow fruits and vegetables and I hope upon returning to Irvine, I can take advantage of our farmers market or even try growing my own produce. 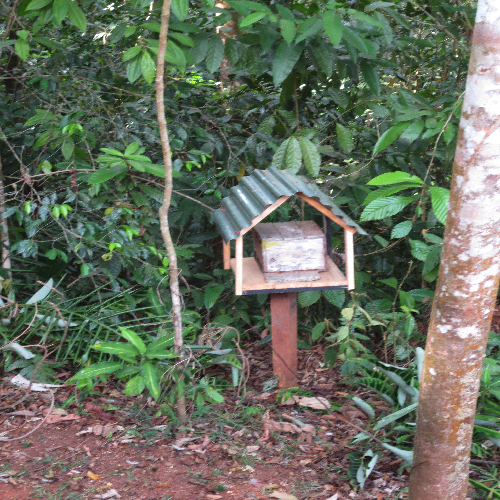 The stingless bees taught me a lesson in where my food comes from and how it is produced. I sure hope one day I can taste honey from those stingless bees someday!